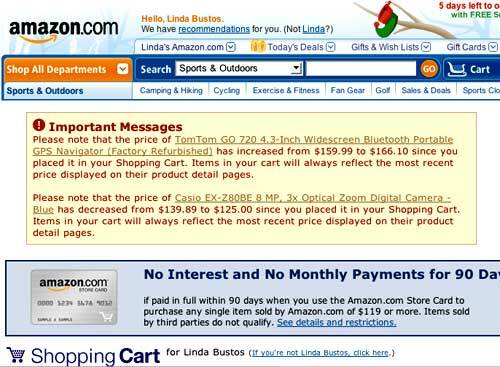 If you’ve added an item to Amazon’s cart without purchasing in the same session, Amazon remembers. For a long time. Please note that the price of TomTom GO 720 4.3-Inch Widescreen Bluetooth Portable GPS Navigator (Factory Refurbished) has increased from $159.99 to $166.10 since you placed it in your Shopping Cart. Items in your cart will always reflect the most recent price displayed on their product detail pages. Please note that the price of Casio EX-Z808BE 8 MP, 3x Optical Zoom Digital Camera – Blue has decreased from $139.89 to $125.00 since you placed it in your Shopping Cart. Items in your cart will always reflect the most recent price displayed on their product detail pages. I triple-checked my email account and I was never notified by email about the price change. I prefer this on-demand approach, as email notification is territory to tread lightly, especially with a cart full of products. However, I would appreciate an email notification if an item in my cart was low stock or sold out (with an option to get on a pre-order list). Showing the change-of-price notice in the cart clearly re-inforces trust with the retailer. A customer may or may not remember an item’s price from 5 months ago (as is the case with the Casio camera above), but if the customer does remember a price (or mistakenly “remember” a price), he or she may balk at a different price upon checkout. “Items in your cart will always reflect the most recent price displayed on their product detail pages.” This is a best practice.